Let’s be honest. 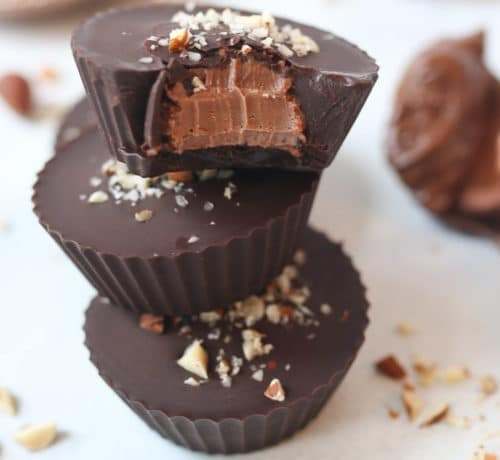 Valentine’s Day Dark Chocolate treats are pretty much a must at any V-day party or date-night. I need chocolate most times of the year, but especially on Valentine’s Day, and these Dark Chocolate Dipped Figs satisfy that craving! And isn’t it nice when someone makes those Valentine’s Day dark chocolate treats FOR you? Le Sigh. 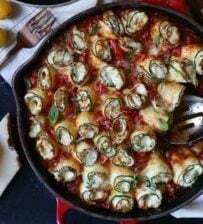 In the near-decade I’ve been with my partner, he has cooked for me a whole two times and I loved it so much I can remember every single dish he made. Once, it was for my birthday, when he schlepped out to Kensington Market in a blizzard to look for authentic Mexican cojita cheese for mini tostadas. And the other time was the night he proposed when he made my favourite mac and cheese and sticky toffee pudding. Okay, so I ended up doing most of the work both times but the thought alone just made my heart melt. Food is such an important and beautiful offering of love. Even if you cook regularly for your partner, making a more thoughtful, fancy meal this Valentine’s Day will definitely win you some brownie points and save you a pricy bill from going out. Valentine’s Day Dark Chocolate Works in Dessert OR Appetizers! Yep. 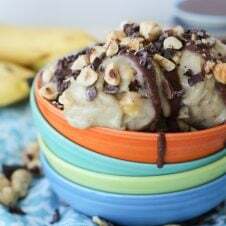 Chocolate isn’t just for dessert. And cheese isn’t just for appetizers. 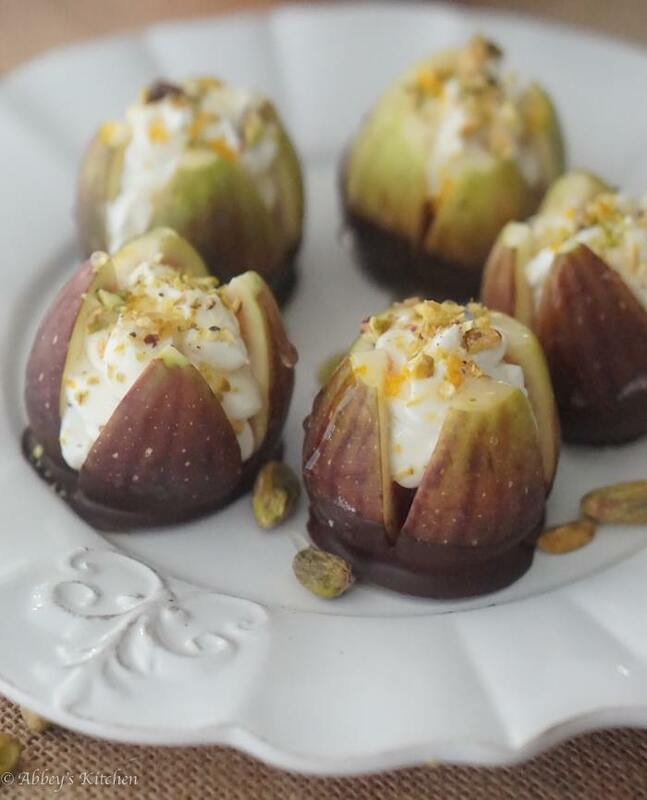 This sweet and savoury Valentine’s Day dark chocolate gluten free appetizer/ dessert is sure to kick off the romance with the aphrodisiac qualities of figs and dark chocolate. I personally think figs are the sexiest fruit in the market- and apparently, I’m not alone. When you cut a fresh fig open to reveal its teeny tiny seeds, it apparently is supposed to remind men of the women’s um… anatomy. 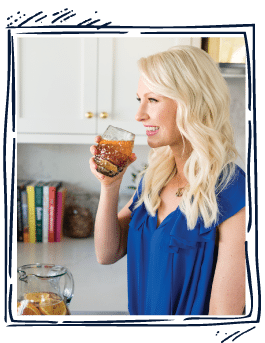 Regardless of what it reminds you of, this recipe is a great start to Valentine’s Day meal and definitely keeps things light enough so that you don’t feel too bloated or tired to enjoy whatever comes next. If-you-know-what-I-mean. And let’s not forget about getting your Valentine’s Day Dark Chocolate fix. It wouldn’t be Valentine’s Day without chocolate. 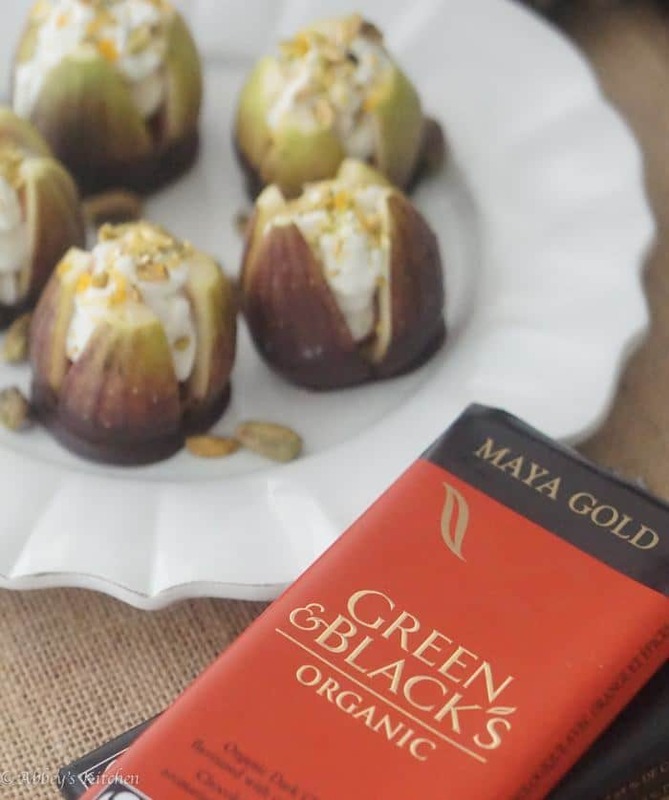 I used my go-to brand, Green & Blacks Organic Maya Gold Dark Chocolate here, which complements the floral figs with its subtle orange and spice flavour. 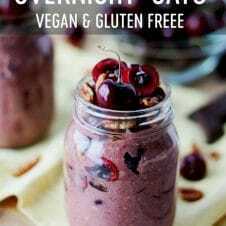 It’s dark and therefore loaded with antioxidants and lower in sugar, and it’s mild bitter flavour helps balance out the sweet fruit and tangy chevre. How are you getting your Valentine’s Day dark in this holiday? 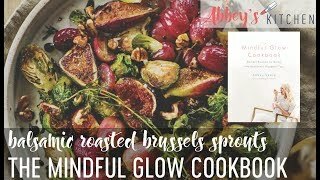 What are some of your favourite chocolate recipes for quick appetizers and deserts? Leave me a comment below and I’ll try to lighten it up! Let's be honest. Valentine's Day Dark Chocolate treats are pretty much a must at any V-day party or date-night. I need chocolate most times of the year, but especially on Valentine's Day, and these Dark Chocolate Dipped Figs satisfy that craving! Prepare a baking sheet with a silicone mat or piece of wax paper. In a small food processor, puree the chevre, yogurt and zest until smooth and light. Transfer it to a piping bag or into a plastic resealable bag with a small hole in the corner cut out. Set aside. Cut the stem off of the fig and cut an X into the tops of them, slicing almost all of the way down to the base. Be careful not to cut fully through the figs. Place the chocolate in a glass heat-proof bowl set over a small saucepan filled an inch high with water. Bring the water to a boil, then reduce the heat to a simmer. Stir the chocolate slowly, allowing it to gently melt in the double-boiler. Once melted, remove from the pot and set aside. Dip the base of the figs into the melted chocolate, swirling to coat the figs about 1/3 of the way up. 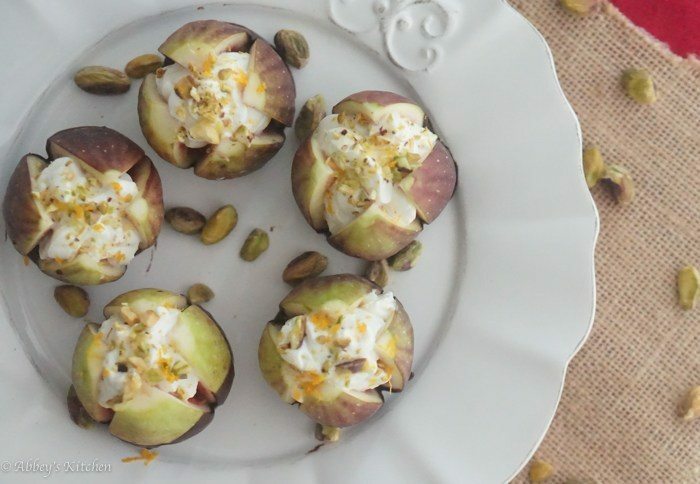 Place onto the prepared baking sheet and continue with the remaining figs. 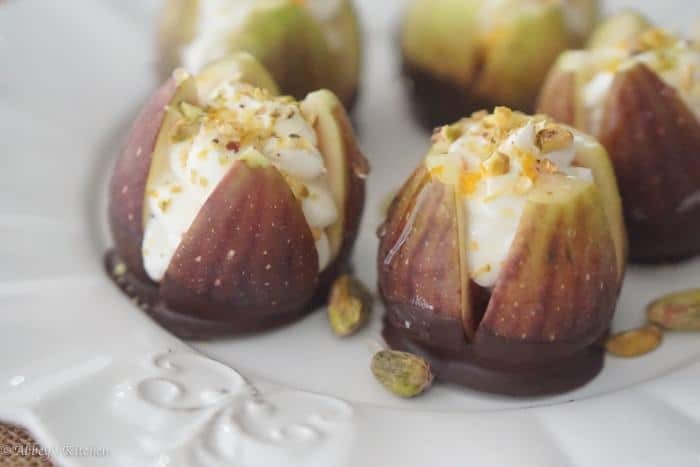 While the chocolate is still wet, pipe the chevre mousse into the figs, prying them open carefully to allow the mousse to get all of the way down to the base. Once filled, gently press the corners together a bit to seal in the filling. Transfer to the fridge to allow to fully set- about 15 minutes. 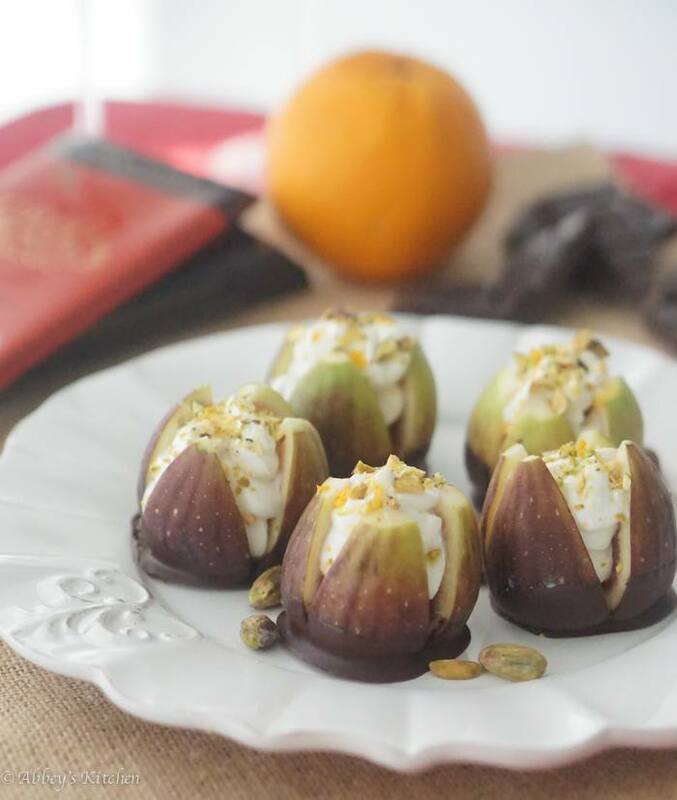 Once the chocolate looks dry and cool and you’re ready to eat, top with crushed pistachios, a drizzle of honey and additional orange zest, if desired. Enjoy immediately. *Note: If you can’t find fresh figs, you can also use fresh strawberries (cut off the stem, sit on its cut top and cut the X from the end of the strawberry) or large dried figs (make a flat base to sit the fig up on). 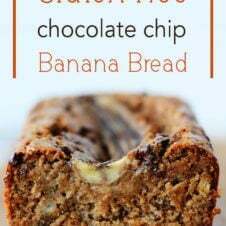 Disclaimer: This recipe was developed in paid partnership with Green & Blacks, however, all opinions are genuine.